The Bradford-born artist's current exhibition ‘The Sun Never Sets’ at Huddersfield Art Gallery draws on his childhood memories of living in Bangladesh while also exploring the impact and legacy of colonialism. Fellow painter Narbi Price asks the questions. 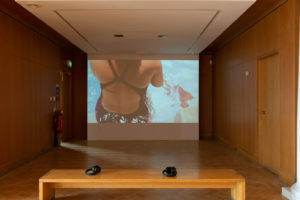 London-based artist Matthew Krishanu’s current solo exhibition ‘The Sun Never Sets’ at Huddersfield Art Gallery is his largest to date, and deals with deep personal and emotive content. 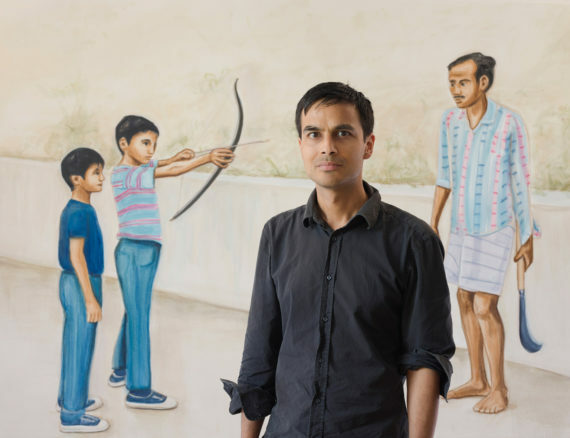 Large and small paintings sit side by side as Krishanu depicts his own childhood memories, at once specific and autobiographical, but also generic image types that appeal to a collective memory. 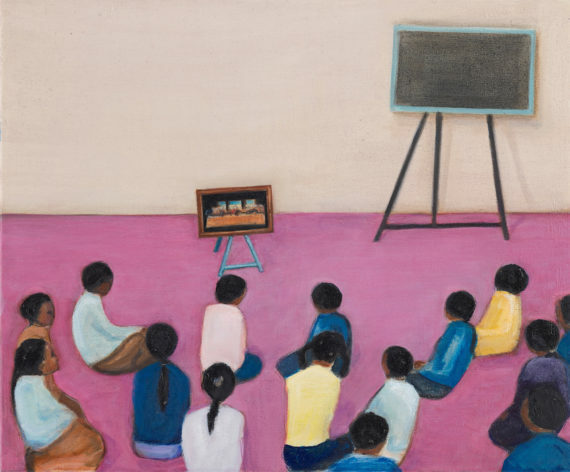 The work skilfully negotiates a tricky path between nostalgia and sentimentality, using an expansive and technically diverse painting style as a lens for recollection. 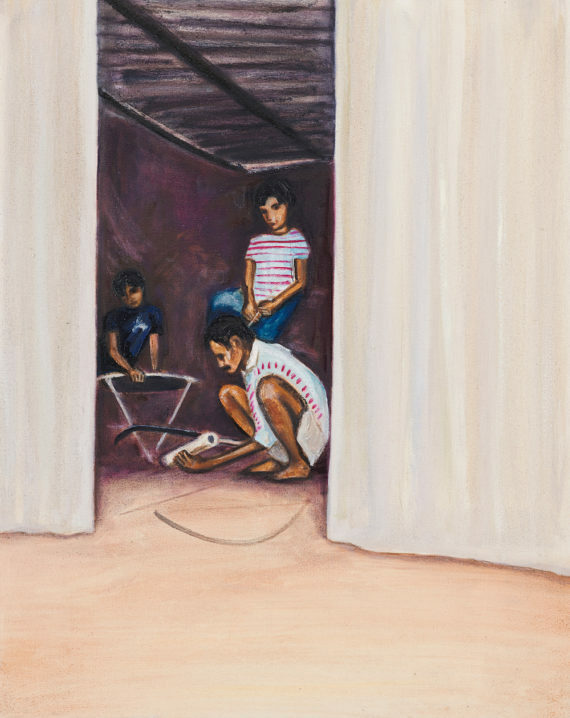 The paintings employ a brevity and naivety that comes with a cerebral and scholarly approach to painting practice, and a deep engagement with art history. Born in Bradford, Krishanu lived in Bangladesh from the age of one to 12 before moving back to England. He graduated from Exeter University with a BA (Hons) Fine Art and English Literature in 2001 and from Central Saint Martins in 2009 with an MA in Fine Art. Recent exhibitions include Contemporary Drawings from Britain, Xi’an Academy of Fine Arts Gallery, China; Contemporary British Watercolours, Oriel Gallery, Antrim, Northern Ireland; and Contemporary Masters from Britain, The Yantai Art Museum, China. His work is also featured in the John Moores Painting Prize 2018 exhibition at Walker Art Gallery, Liverpool and he has recently had work acquired by the Arts Council Collection. Can you outline some of the themes you’re aiming to communicate with your work? In the exhibition ‘The Sun Never Sets’, I’m aiming to create a world that centres on two characters based on my brother and myself as children. This world is set in Bangladesh and India, and divided into four main series: ‘Another Country’ (featuring one or both of the boys), ‘Mission’ (which explores Christian missionaries, churches and congregations), ‘Expatriates’ (focussing on how Europeans abroad can appear ‘other’ or exotic), and ‘City’ (which looks at the built landscape of Dhaka). I’m interested in how much of this world is formed out of the history of the British Empire, which was once known as the empire upon which ‘the sun never sets’ due to its vastness. The exhibition brings together the different series of works for the first time, exploring how the themes overlap and complement each other, and expanding the scale of the work. My invitation is for the viewer to see this painted world as if through the eyes of the two boys. Your work deals with questions of memory, identity and nostalgia. How do you negotiate sentimentality in the choice of subject matter? I am most interested in painting people I care about – I find it easier to give characters a sense of interior life if I know them well. However, I do not consider them as portraits of particular people. 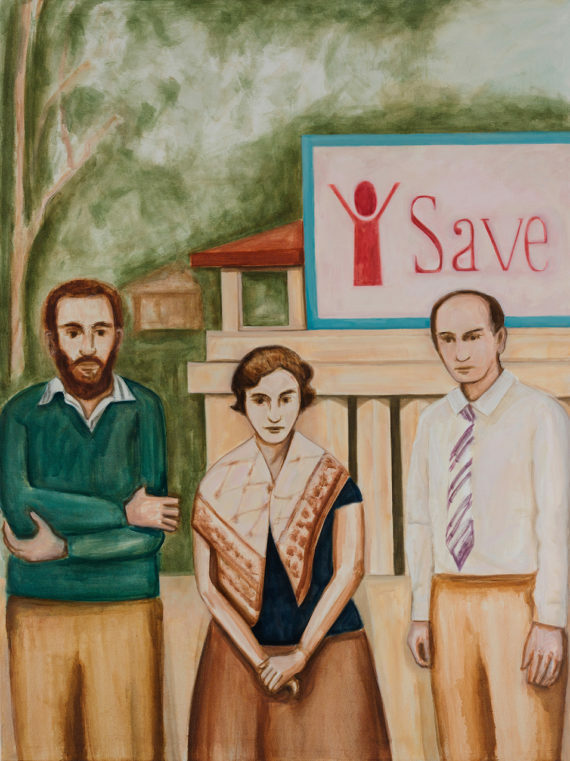 I think of all the characters in my paintings as being more like avatars: while the two boys are based on me and my brother, I also think of them as being separate from us – they have their own life. 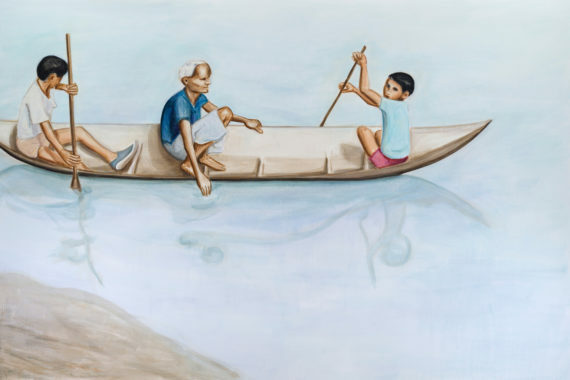 I consciously avoid softening or sentimentalising the childhood world – I paint the boys alongside the carcass of a drowned cow in Skeleton, and in Boat they are rowing a narrow canoe, while the adult passenger holds on for safety. 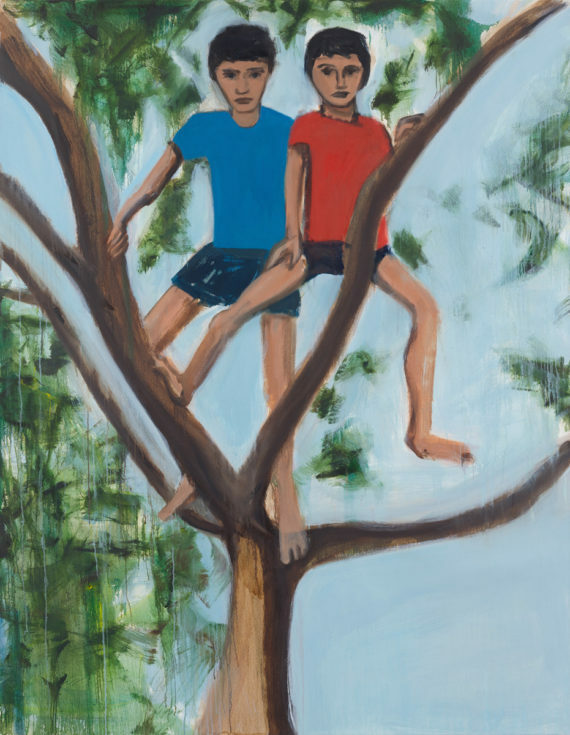 In Limbs the boys look triumphant climbing a tree – the limbs of the tree blend with their own. I’m also interested in the potentially sinister connotations of a crucifix, bull’s head or tiger mask; but equally the symbols of Western influence – the ‘Save the Children’ logo, a ship’s sails on the horizon, or the white cassock of a missionary. In focusing on your childhood in Bangladesh and India, how do you feel about the risk of a kind of orientalism or anthropological reading? Has the work ever been shown in Bangladesh? 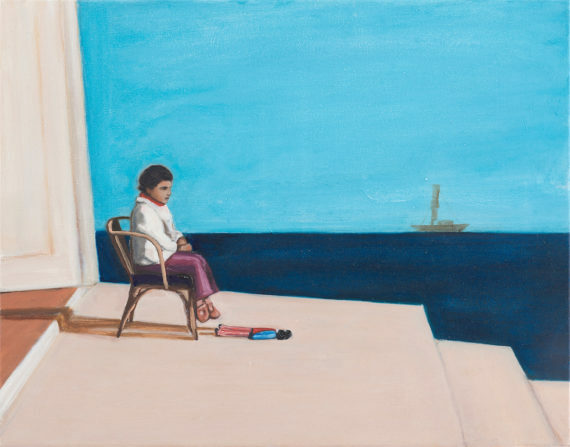 While the works are based on childhood experience, overall ‘The Sun Never Sets’ is more about constructing a world that is a fictionalised / dreamlike space, exploring particular subjects (such as ‘Mission’ or ‘Expatriates’), as if through the gaze of the two boys. In this respect, the anthropological gaze is more upon the missionaries and expatriates as they present us with their costume, pose and role. Perhaps this is a conscious attempt to reverse the orientalist gaze – I am representing myself as the central subject, while constructing the occidental characters as exotic, uncomfortable, or strange. I haven’t yet exhibited in Bangladesh, although I plan to, but Bangladeshi (and Indian) viewers have a particular access to the work. Viewers have told me that they feel a resonance with their own childhood and recognise the light and atmospheres I capture. For me this is an important part of the work – different viewers will feel drawn in or kept at bay from the paintings depending on their own backgrounds and world views. There are some works that have a particularly direct interrelation in the show – is a sequential narrative important? I very rarely view exhibitions sequentially, preferring to trace my own route through a show. 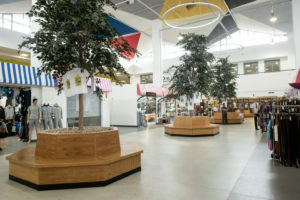 When deciding the exhibition’s layout, the works were placed according to their visual relationships, and are broadly spaced out across the two rooms according to their size (smaller paintings in the first room, big in the second). Certain characters – such as the two boys, or the European priest – recur among the paintings, and I want the viewer to recognise them as the same people. The children are sometimes older, sometimes younger, and there is no chronology to this in the layout. My theme ‘Another Country’ is inspired by the LP Hartley line, ‘The past is a foreign country: they do things differently there’. I think of my painted world as being another country, which is outside of time. In a painting, moments are fixed: people do not age or die, and the sun never sets. In that respect I think of the scenes depicted in all of the paintings as existing concurrently, not sequentially. On a technical level the paintings are multi-layered but thinly painted with scumbles and glazes – there seems to be a palpable sense of searching in the application. Can you say a little bit about the pragmatics of your technique and how you use paint to serve the themes in the work? I have several paintings on the go at any one time. I also have dozens of works that are in a state of unfinish / temporary abandonment that I might return to at any time. Generally speaking I will start a painting with a thin wash of paint (most often in oils, sometimes acrylics), with a sense of the size I want the final image to be, and its composition. At any point during the painting process I am open for the painting to be taken in a different direction. For instance in Golly, the setting began as a garden in Scotland, but half way through I changed the background into an ocean, and then added in a ship at the end. I love the fact that paint can be built in thin, transparent layers (like water, or hazy memories), or in thick, opaque layers that conceal what is beneath. I don’t have a formula for how I paint, although nearly always the paintings are built up in multiple layers over a period of weeks or months. I don’t begin with any pre-drawing on the canvas or board, but have often worked up ideas in sketchbooks or on paper (usually studies from photographs or memory-drawings). I get to the studio, and ask ‘what does the painting need next?’ until it is complete. Sometimes I overwork and have to sand or scrape back (or paint opaquely on top); other times I’ll under-work a painting, and have to return to it having initially thought it complete. Is this an ongoing or discrete body of work? Is there a cut-off point where the memories are too recent? How would they work with an English landscape? I lived in Bangladesh from the age of one until 12. I then moved with family to Southampton and began secondary school (and adolescence) there. Therefore all of my childhood memories are bound up in a particular place, climate and atmosphere – there was an abrupt break between Bangladesh and my teenage years. While some of the source material for ‘The Sun Never Sets’ is from more recent visits to India, when I paint these subjects I am placing them in the time period of my childhood. I don’t see a cut-off point as such for the series, as it is as much a constructed / invented world as it is autobiographical / memory-based. I am partly painting these themes as I haven’t seen them being painted before, and I want to add them to the canon of painting. It feels like there is still a lot more room to grow the project, particularly in relation to my theme of ‘painting about religion’ – I am interested in how Western historical painting appears throughout the globe as a religious teaching tool, an idea I explore in Mission School, currently showing in the John Moores Painting Prize exhibition. I also have a small, earlier version of it in ‘The Sun Never Sets’. Regarding the English landscape, sometimes the sea, rocks and hills of England feature in my work, particularly in works on paper. The biggest ongoing series drawn directly from England is my ‘Crow’ series, based on photographs of crows I have taken around London. However, when I paint these I am adding them to the world of ‘The Sun Never Sets’ – they become mythical, somehow outside of time and place.